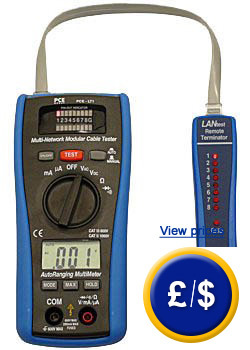 The PCE-LT1 LAN Analyser is ideal to quickly test network connections. 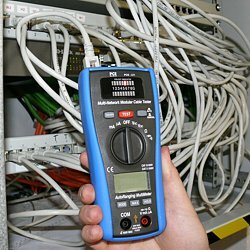 With this LAN analyser you can verify continuity in 8 pin RJ-45 cables and connectors, as well as co-axial cables with BNC connectors (using an optional adaptor), as well as confirm connectivity and short circuits. The LEDs show the pin configurations of the cable being tested The PCE-LT1 LAN analyser detects cabling errors, common to Ethernet, in a seconds. 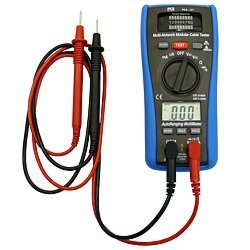 An overview of all LAN analysers available at PCE Instruments can be found here. Operating conditions 0 to 40°C/5 to 95% r.h.
For companies that wish to integrate the LAN analyser into their internal quality control system or to conduct recalibrations. The certificate meets ISO standards and includes a certificate with all of the measurement values. It also serves to satisfy ISO inspections.